With sheer exhaustion, I slept quite well….but, with my body-clock even more confused, with yet another time-change, it is probably not surprising to note that 4am on 3rd June saw me wide awake! The allure of the Sudoku puzzlebook was short-lived, and so I quietly dressed so as not to disturb the Better Half, and headed up on deck with video and map. There were a number of other idiots wandering about and we briefly passed the time of day, before keeping on the move because of the cold. I took the opportunity of doing four laps of the pedestrian deck, so felt quite pleased with myself so treated myself to coffee in the breakfast bar when it opened. …..and so, we dropped-off some folk who had booked to go off to the Glacier by bum-boat, whilst the rest of us had to be content with heading for the restaurant for lunch. Today was the birthday of the Good Lady. Discretion (and the threat of a thick ear) forbids me mentioning an actual number! 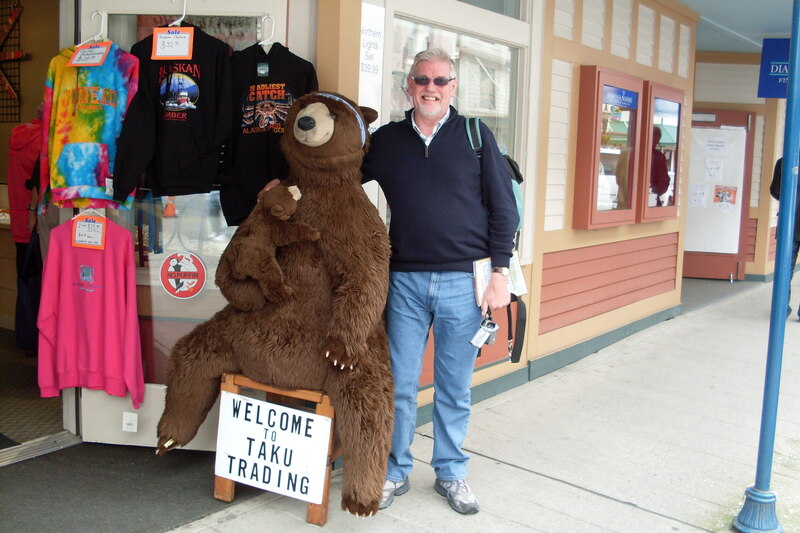 However it was going to be memorable in that, firstly, it was to be our first land-fall in Alaska, and secondly I would not have to get her any gold for a present…..explanation in a minute! 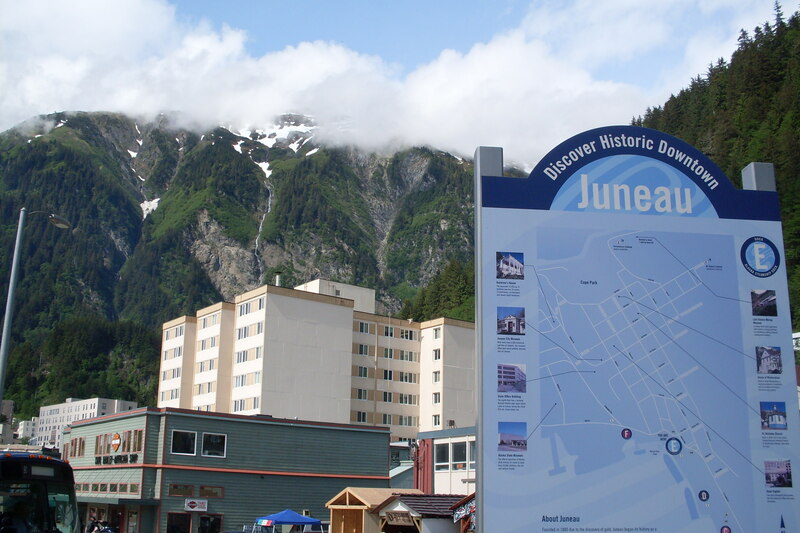 Juneau is the capital of Alaska, and depends heavily on the sea and air, in that there is no land approach available. 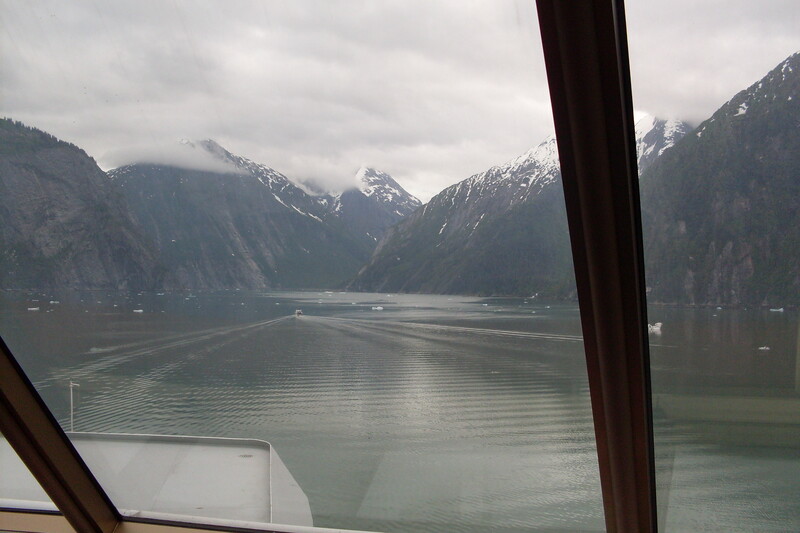 Everything coming to or from Juneau must come by boat or seaplane. You can see why as soon as you come off the ship when the surrounding hills become even more evident. We didn’t really know what to expect even although I had looked at it on Google Street, so knew the general layout. But we found the inhabitants quite friendly. When walking through the main street we came upon a policeman, and had a chat. We did mention that our daughter was a policewoman, and he presented us with a sew-on badge as issued to the Alaskan Police! Even the animals were friendly…….. However, this was just a lead-up to the main event of the day…getting the present for the Better Half. We were picked-up at the quayside and met by a rather aged-looking gentleman with a large hat, extensive tobacco-stained beard, and an unbelievable drawl. 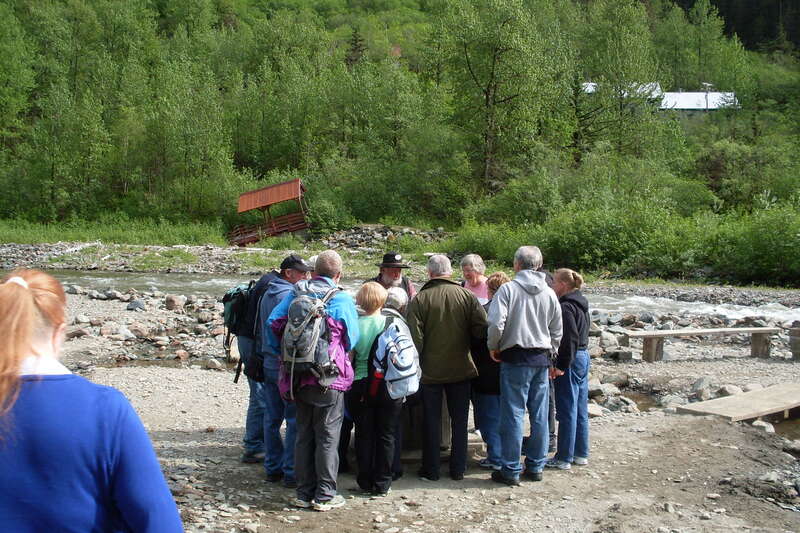 We were then taken by an old minibus to a creek (you notice my use of the Alaskan vernacular! ), where we were given a lesson on panning for gold. We each received a ‘pan’ with mud and grit already in it, and shown how to swirl it about in the water. Lo and behold, each of us found a few flakes of a bright metallic substance in the bottom of our ‘pan’! So with our combined ‘flakes’ we could have just about covered a large match-head!…so fortunes were not to be made. Anyway I think each of the pans had been ‘seeded’! Never mind, it was all just a bit of fun! A return to the relative civility of the ship and a lovely meal in the Italian Restaurant, ended an interesting day! It was worth recording her good looks for posterity, so we hunted about for a suitable location. The following is that photo….So her birthday was recorded by a photo showing Neptune with his hand on her shoulder! Leaving Vancouver, cruising on the Holland American ‘Hollandam’ heading North on the Inner Passage for the first time to Alaska………………………..
I’m not a good sleeper at the best of times, tossing and turning, wakening with the slightest noise, and with a body which finds it difficult to go back to sleep once wakened. But, boy, was I tired when my head hit the pillow on our first night out of Vancouver on the 1st of June…….the start of our journey to this mysterious place called Alaska! Don’t misunderstand me; it had been a week which had been wonderful, busy, awe-inspiring, exciting, revelationery (is that a real word? 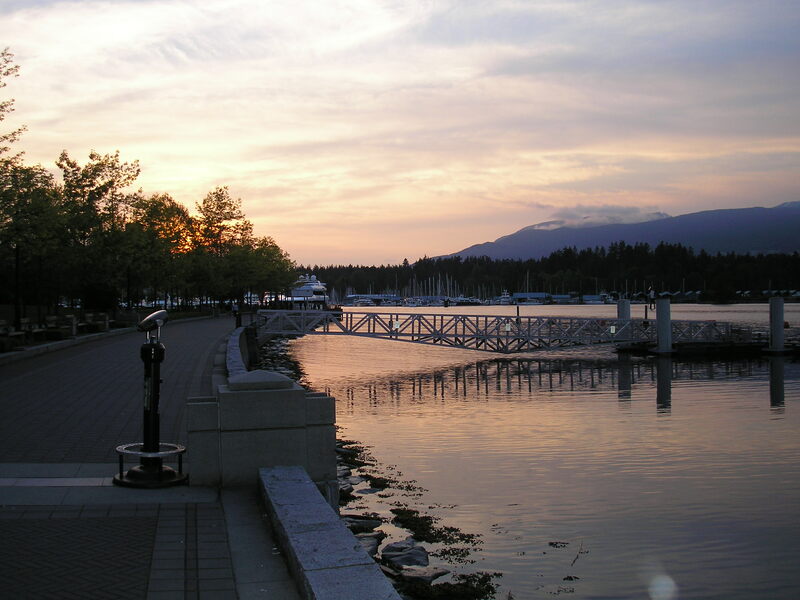 ), with the long flight, snow, glaciers, Rocky Mountaineer train, different food, and latterly the calming effect of Vancouver. The senses had been over-whelmed, and we were somewhat glad to be spending seven nights in the same bed without the constant repacking and moving-on. Our knowledge of what was to come had been taken from travel books, Google, what others had told us, and a few television programmes. So all these thoughts were drifting through my mind as I tried to get to sleep. Meanwhile Lady was happily breathing with the sleep of the innocent! I woke on the morning of 2nd June at 5.30 am (not an unusual scenario for men of a certain age! ), and went up on deck (after dressing of course!) for a wander round. Although it was bright, there was nothing really to see as we were obviously some distance from land on either side. This land, and Inner Passage, was bigger than I had imagined! Now, I have often been told-off, by you-know-who, for having my still camera or DVD camera by my side ready for use at the most inappropriate times……but no such stricture applied on this holiday as we wanted as complete a record as possible. We had been told that this area should be a good area for spotting whales, and over a leisurely breakfast, they materialised quite a few times. However, the whales felt no need to give any advance warning of leaving or entering the water! It is only when the event has started, been spotted by someone, who then hollers about it, and I grab one of my cameras and point it in approximately the right direction, that I have a hope of getting a shot. By that time, of course, the blighter has disappeared, and I get lovely shots of empty water, only to find it re-appearing some distance away, after the camera has been set-down! Try doing this as you are munching your cereal, or swilling coffee and you can see that discontent returned to the marriage relationship occasionally! I tried leaving them switched-on, but then either achieved dead batteries, or shots of feet or floor, and the recording of chatter…so that didn’t work. However I did get one or two classic video shots of the tails but none of the great snout coming out of the water…..but never mind…there are some lovely shots on You tube! The ship boasted a large theatre which hosted many events. After breakfast we attended an interview on stage with the ‘Hotel Manager’ who is responsible for some 7000 meals per day, in 7 restaurants…. the mind boggles! We then decided on the shore trips we wanted (some at an eye-watering cost! )….however ‘we may not pass this way again’…. There were good areas for walking and the promenade deck was exactly 1/3 of a mile right round….so we felt highly virtuous that we did several circuits every day. The above shows us enjoying a well-earned rest after a brisk walk. The sports ‘nutters’ were well-catered-for, with a a basketball and a tennis court, and those who simply wanted to sit at slot machines could do so…with the only exercise being for their elbow! There was also a very good library, and now that I was in the area, I was reminded of a poem my father occasionally recited when I was a child. All I could remember was the name of the hero…Dangerous Dan McGrew, and the author, Robert W Service. In seconds I had been directed to a book of his poems and had great joy in reading ‘The Shooting of Dan McGrew’ (who had a lady known as Lou), and ‘The Cremation of Sam McGhee’, who when he was alive, had hated the infernal cold of Alaska!….hence the name of the poem) and who could blame him! As is probably the norm with most people, you find couples who come from your next of the woods and this also applied to us. Two couples attached themselves to us, but without suffocating the friendship. It was good to have someone else to join with or pass the time of day. We all went separately to the presentation devoted to booking shore trips, as we do not like to be pressurised by what others want to see! in the event we all did different things. 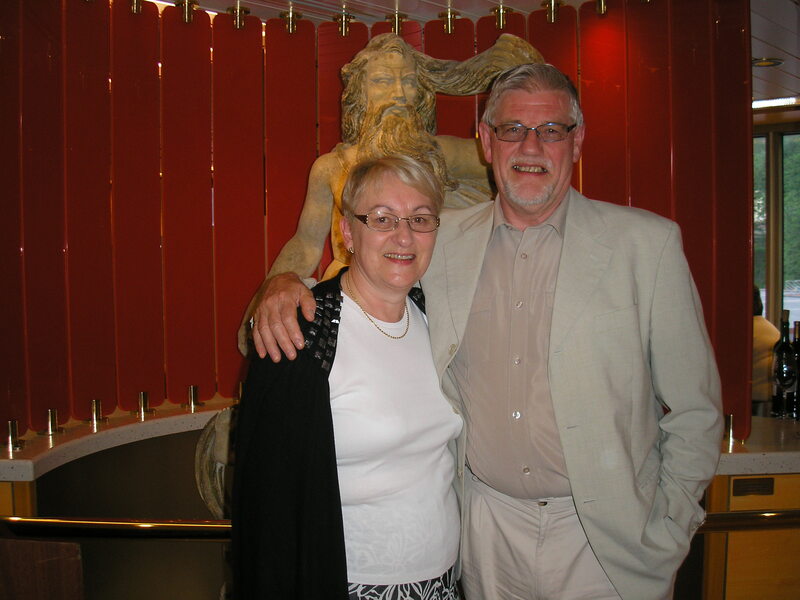 Dinner on the main Lido deck , a great Broadway show, and karaoke in the Crows’ Nest bar ended the first day out…..unfortunately, before bed we had to change watches back one hour! Would our brain and body clock ever be the same again?? ………so far……….flight Glasgow to Calgary; transfer to Banff and the snow; making waffles; Lake Louise and the marvellous Hotel; Athabasca Glacier; Athabasca Falls; two days on the Rocky Mountaineer; walking in Stanley Park……and the noisy air-conditioning! …….Sadly we were soon to leave a lovely city, Vancouver. We had scarcely scratched the surface and we could only imagine from guide books what the rest was like. We had not got(gotten?) to Victoria or anywhere on Vancouver Island and I promised Lady that this is one area to which I would happily return. This photo was taken down at the harbour just before sunset…marvellous isn’t it? It was now time to get our last sleep on terra firma for a week, in the Blue Horizon Hotel, but the infernal air-conditioning system whirred away, just above the threshhold of hearing, and hence, of sleep ! However, we had another good breakfast and a short taxi ride took us back down to the Harbour, where the cruise-ships lay. We were really getting excited! We were physically still on Canadian soil, but politically it was American, as we would be. heading into American waters, so we were questioned, finger-printed, and photographed by American security border staff. I had inadvertently made a slight error in my on-line visa application, and was slightly apprehensive that I might be considered suspicious, especially with my Irish accent. They were perfectly pleasant and luckily they didn’t seem to have noticed the mistake, so we got through with a hugh sigh of relief…..but what if? 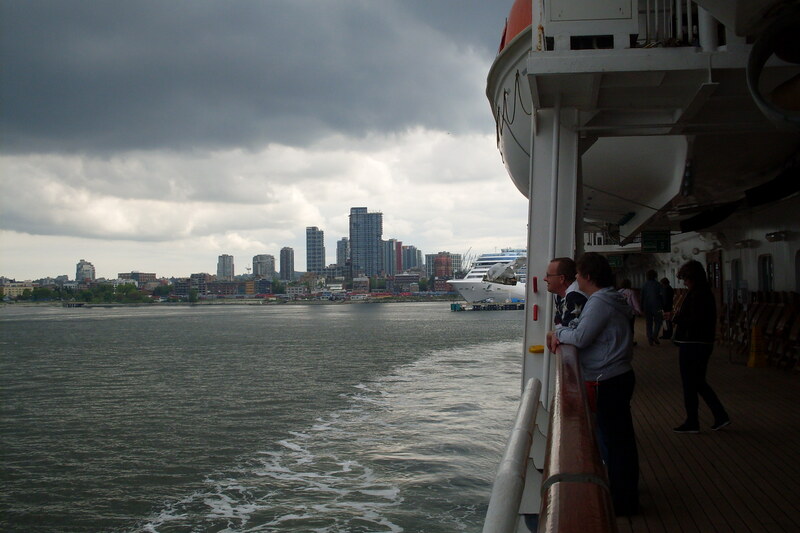 Our ship was the American Holland ‘Volendam’ and could take 1400 passengers. We had never been on such a large cruise ship before…our Mediterranean cruise had 400, and our Rhine/Mosel ship only took about 100 folk. However, there was no feeling of claustrophobia or crowds as we were taken to our ‘Stateroom’ F1822 on Dolphin Deck. 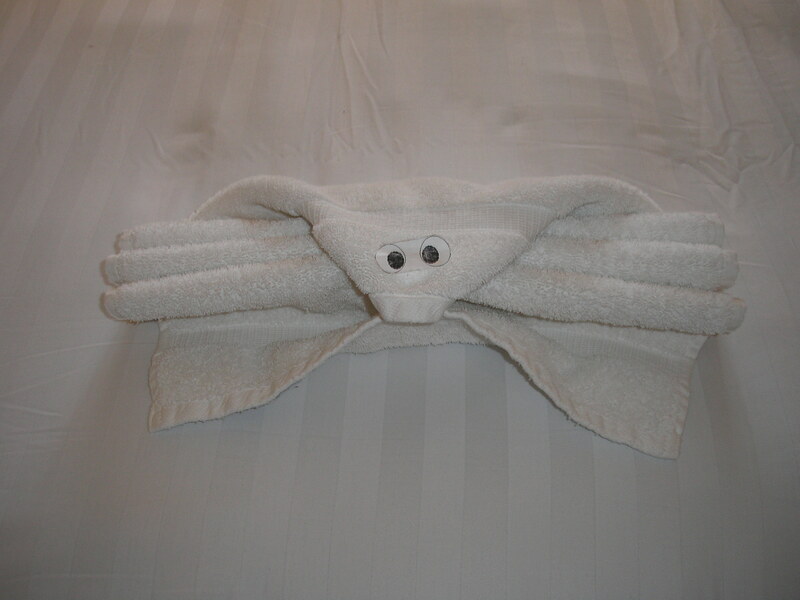 each evening we were faced with a strange animal on our bed made with a folded hand-towel! ‘Stateroom’ sounds very posh, and often expectations are unrealised, but we were very pleased with our king-size bed, panoramic window overlooking the harbour, loads of hanging and drawer storage space (mainly commandeered by Lady of course), good-sized shower-room and loo, dressing-table (eventually featuring a number of pills and potions, as well as a few drink bottles), cumfy sofa, and television….the following link ahould work. I, like most men, would probably have preferred to go out immediately, for a walk round to get my bearings…..but Lady had other ideas! Cases had to be instantly unpacked, hangers had to be acquired and drawers utilised, so that clothes which had been left unpacked for a week could now be allowed to un-crease, so that she could go out to meet her public, looking pristine. My argument that some 1398 other people might have some creases in their attire cut no ice, I’m afraid! Life-boat drill whilst we were still in port, was a bit of a farce. People wandered to their Station late, chatted, moved about, so they were difficult for the Crew to find, wandered off when they thought it was all over, and no-one donned a life-jacket. It was in sharp contrast to some 16 years previously, when men and women were separated, life-jacket-donning was compulsory and no photos or video was allowed! That completed (if not remembered!) we were able to set sail. There’s something about that time just before any journey starts (be it plane, sea, train or car), when you want to get away, you know that certain things have to be checked (gas off, front door locked; ear plugs in, hand luggage under the seat, lap-belts fastened, etc) but you just want to get going. With planes there then follows the adrenalin-rush of take-off; with cars there is the last wave to the neighbours; with trains there is the noisy clanking over the points and the unsightly backs of houses, as we get on our way. There is no such effect with large liners. After the ropes have been unhooked, they seem to gently slink away from the quayside. Some make a great noise about it whilst others, like ours, waited until an appropriate time before sounding their hooter. 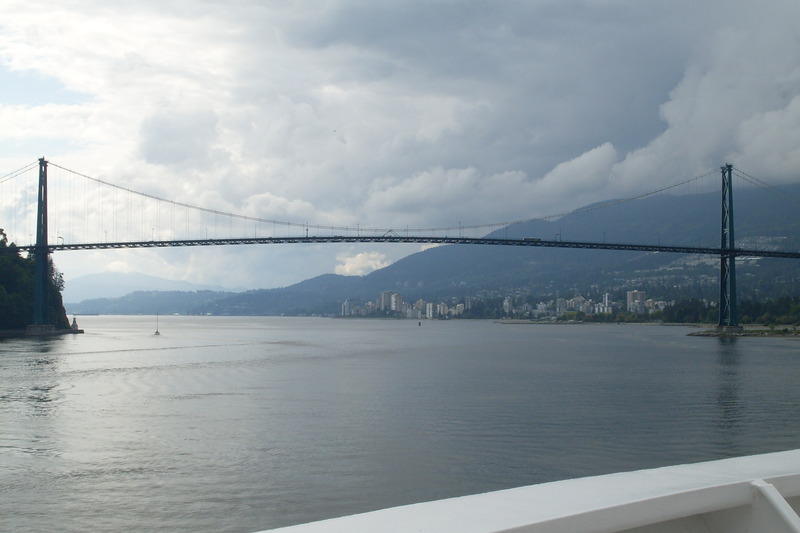 In Vancouver Harbour it seems to be just as we went under the wonderful suspension bridge and we headed for the Inside Passage…we were leaving the black clouds and were on our way! Duty done, we went to the Lido deck (one of seven restaurants) for a barbecue with salmon. This was a large deck with undercover tables and also a large area where the roof could open, just like Wimbleton. It had a fair-sized pool, but the sight of some semi-clad bodies entering and leaving the water did not do anything for the digestion! However, the food was fine, and was, surprisingly, served by the staff. This was as a temporary measure for the first few days to prevent the possibility of e-coli or other bugs being brought-in by passengers…always a worry. The goodly number of shops on board pleased the Lady so we had to have a look. I managed to get a good book called the ‘Alaskan Cruise Handbook’ (not surprisingly) which gave the maps, mileage references and the history of exploration in the area….I can certainly recommend it as I am reading it some time after returning home. 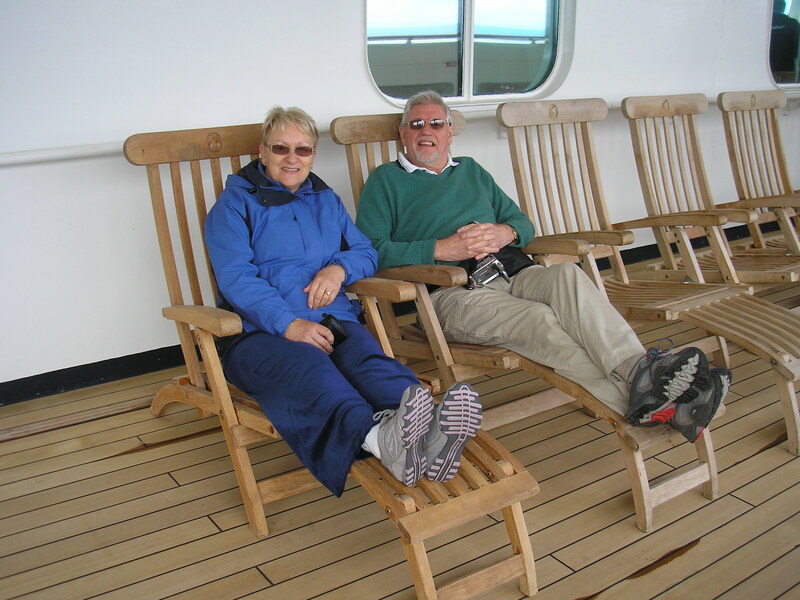 A brief walk round the promenade deck, and we were in bed at 11.45….but it was still bright enough outside to read by. Tomorrow would be exciting!